George Osborne, the editor of the Evening Standard, plans to cover the paper in advertising "as many times as we are asked to wrap it". 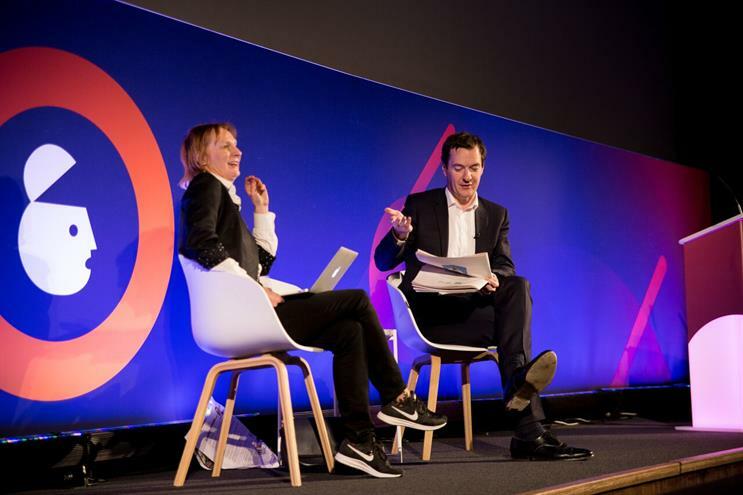 The former Conservative chancellor, whose appointment at the freesheet shocked the media industry last year, told Advertising Week delegates yesterday that Evening Standard readers appreciate well-executed ad campaigns. He also said that he is "perfectly capable of distinguishing my own personal loyalties versus what is in the interests of the paper". Osborne explained on stage to Standard columnist Anne McElvoy how advertorial products such as cover wraps were not just a necessary revenue stream but part of delivering a great product for readers. "It’s not like I’m looking for some patronage," Osborne said, "I can just get on and edit the paper for our readers and work with our advertisers to deliver a great product for them as well and be original in doing that." He used advertising for the Dunkirk film as an example where the paper looked like it was on the day of the invasion. "Instead of readers complaining about having advertorial on the front they loved it that day," Osborne said. "That was a creative collaboration between the advertiser and our very good commercial team." Osborne also pointed to last July’s translucent cover wrap (below) to promote the popular Game of Thrones TV show on Sky Atlantic, which gave a frosty effect over the messaging "Winter is here". He said: "Simply put, our product is available for free, so we’ve got to raise advertising and sponsorship to provide that product for free. We are not proud about that in any sort of sniffy sense, we will work with every advertiser to design a product that works for the newspaper and we will wrap the paper as many times as we are asked to wrap it when we get good deals. "Interestingly it doesn’t have a huge impact on the circulation – when it pisses with rain it’s a real dampener on our circulation because people won’t stop for a second – that would cost us 50,000 off circulation. "But I think good advertising can make it look better. And the Game of Thrones [example] is good… it was done in a very interesting and original way and made it a better paper… the advertising made it a cool thing." Osborne also singled out the insurer Hiscox as an important Standard advertiser that "gets a mention in the paper every day", as well as shopping centre operator Westfield which "is a destination point and gets advertising space". "I don’t feel in any way compromised by those partnerships… they allow us to invest in good quality journalism. Things that we’ve not been so well staffed to cover, now we can cover more," he added. Referring to last week’s redesign, which saw the paper rebranded from The London Evening Standard, Osborne pointed to the new three-page travel section as being a particular opportunity for travel companies to target people in their 30s and 40s. Osborne said the Standard has an average reader age of 36-year-olds and that the paper attracts a much younger audience than paid-for national newspapers because it is consumed on the tube, whose users are made up of a "classless" demographic.